I am very please to launch my new series called Travel Inspirations with a guest post by Abigail King from Inside the Travel Lab. Sometimes it’s around the familiar corner and sometimes it’s around the world, but you never know when your travels will take you to a place that hits you deep, a place you will carry with you for the rest of your travels. This week Abigail shares with us some moving moments and beautiful photographs from her travels in Hiroshima, Japan. Welcome, Abigail! The view from Miyajima island is often described as one of the most beautiful in Japan. A softly curved Torii, a scarlet figure a little like the symbol pi, rises out of the calm water against a backdrop of mountains and the ferryboats crossing from Hiroshima. Laura invited me to write about a place I love and how it inspired me and I thought of this corner of the world. It’s tranquil now, with its rows of stony lanterns and gently lapping shore, but in 1945 it witnessed one of history’s worst moments. When the Enola Gay dropped the world’s first atomic bomb, killing 80,000 in a single day and thousands more through injury and disease, the world was introduced to a new level of fear and horror. One that became synonymous with the name of the place itself. How could such an act become inspiring? A visit to twenty-first century Hiroshima, a clean city with efficient trams, schoolchildren in uniform, shopkeepers, parks and all the workings of a healthy, happy place, showed me the power of healing. The Peace Memorial Park uses monuments, rainbow paper cranes and commemorative services not only to remember the dead but also to promote peace. A flame burns in front of the cenotaph, not in vengeance or retribution, but in peace. Across the water, on Miyajima island, it’s easy to get swept up in the tourist driven port that sells geisha shoes, rice scoops and trinkets covered in calligraphy. However, as the sunlight fades, the island offers quiet, inspiration and even a glimpse of peace. Abigail King is a journalist with a passion for travel. She blogs at Inside the Travel Lab and writes travel features for Cheap Weekend Breaks and MNUI Travel Insurance. Travel Inspirations – A New Series on Ciao Amalfi! Many of you who have been regular readers of Ciao Amalfi over the past year will know how inspired I am on a daily basis by the distinctive beauty of the Amalfi Coast. I feel many days as if it is inside me now, as if it has become a part of who I am here in Italy. Now I can’t imagine my life anyplace else but here on the Amalfi Coast. This passion has diverted my career path from art historian to travel writer, a path that I can pursue and that keeps me here in Italy. And this is exactly where I want to be. With this in mind, I can think of no better theme for a new weekly series than to present similar stories about passion, place and how where we are impacts and influences who we are. Tomorrow I’m excited to launch a new series on Ciao Amalfi called Travel Inspirations, where I will share guest posts by talented writers around the blogosphere. Along the way I might just share some of the spots on the Amalfi Coast and in Campania that have inspired my path. Stop back by tomorrow for the first Tuesday post of Travel Inspirations! Last Friday morning we set off early for the hour and a half drive to the newly opened IKEA Salerno / Baronissi. There are currently 18 IKEA stores in Italy, one of the newest being the store that opened just outside Salerno at the end of February. With a big long list of items to furnish an apartment, I held my boyfriend’s hand as we walked in for his very first IKEA experience . . .
. . . and six hours later, two very tired people walked out. Two exhausted, but relieved, people who had found just about everything on that long shopping list. Thank goodness for IKEA! For those of you who have experienced IKEA, this store was just about like the others I have been to in Minnesota, Virginia and Maryland. The main difference was the kitchen section, which was much more elaborate here in Italy where furnishing a kitchen is more common than it is in America. The wall of oven doors stretching out in both directions is what really hit that difference home for me! The IKEA Salerno is the second store to open in Campania. I remember once spotting the other store in Naples from the airplane as I was landing at Capodichino airport. Yes, it’s that big! One of the most memorable moments of the day was in the morning when I noticed a sign on the autostrada outside Salerno to watch for cows. “On the autostrada?” I asked my boyfriend, describing the sign. Given how Italians drive on the autostrada, the last thing needed would be cows wandering across the interstate. On the way home passing by the same area, we noticed an extremely steep hillside right next to the autostrada with cows precariously climbing up and grazing. “Wow, look at those cows all the way up there!” I said leaning forward to gaze up out of the front windshield. Suddenly, and at the same moment, we both realized that perhaps that yellow warming sign wasn’t at all about cows crossing the autostrada. “Watch out for falling cows!” my boyfriend laughed as we zoomed by. Quite an end to quite a day! I returned to find absolutely glorious and sunny spring weather on the Amalfi Coast. The air is still cool in the shade, but when the sun shines all is right with the world and everyone knows la primavera is just around the corner. These are photos I snapped today while out running errands in Amalfi. Walking into Piazza Duomo, the main square in Amalfi, I heard a band playing. How festive! The Mounds View High School Band from Arden Hills, Minnesota were set up in the sun at the base of the steps to the Duomo of Amalfi. A crowd of locals standing around were enjoying the music and the sun. So I naturally joined in and smiled as the crowd sang along to the Italian national anthem played by the Minnesota band. Last year about this time I happened across another band group from Minnesota playing in the Piazza Duomo in Amalfi. Since I went to graduate school in the Twin Cities, it’s always fun to see other folks from Minnesota in Amalfi. I love stumbling across moments like these here on the Amalfi Coast. It’s good to be home!! It’s March already, and that means it’s time to start looking for those sunny and warm early spring days to start coming. I hear my daffodils are blooming quite happily this year, which means they survived the move across the garden last year just fine. I hope there will still be a few bright yellow bursts in the garden when I return! But before we turn all sunshine and blue skies, which I know we’re all eager for this year, I want to share with you one of the most beautiful moments from this past winter on the Amalfi Coast. A few weeks ago a clap of thunder just after dark startled us. I hurried around turning off and unplugging everything, and just as I finished the snowflakes started falling. The wind swirled as the thunder rumbled in across the mountains. A thunder snowstorm! For those of you who follow From Australia to Italy, Leanne down in Calabria experienced the same thing. (Only they got a good deal more snow down there. And they say Calabria is HOT!) 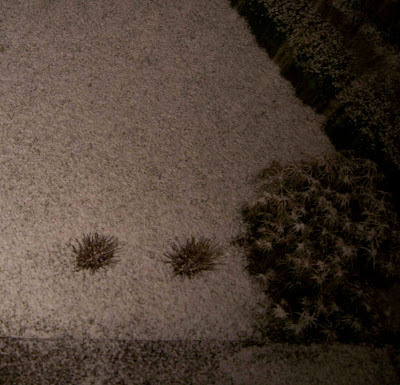 Soon the wind stopped and the biggest sugar snowflakes started gently coming down covering the garden and terrace. 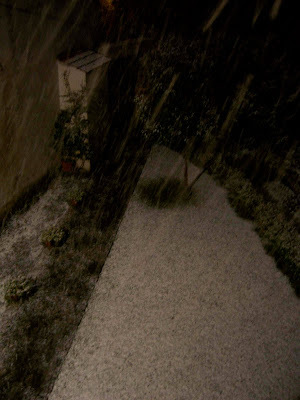 One of the cats sat covered by a small overhang, head darting in all directions trying to see each and every snowflake. We weren’t much different with our heads out the window listening, trying to hear something in the snow but only catching the distant laughter of children. 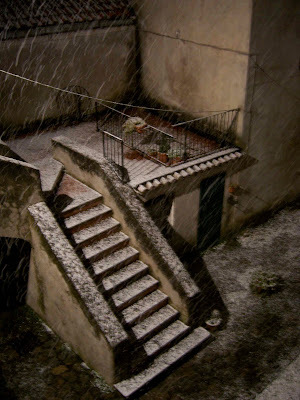 It snows rarely here on the Amalfi Coast, making it a wondrous event even for so-called adults like me. Truth is, I’m always a bit giddy on the inside when the snow falls. The garden turned white, and part of the beauty was that we all knew it wouldn’t last long. By morning there were only a few traces and these rather dark videos and photographs to remind me of the beautiful, sparkling night snow of the previous evening. Some things truly can’t be captured. So you put down the camera, the pen, close the laptop, pull a warm hat over your head and stick your head out the window, absorbing the magical moments!